Sonar-equipped ship finds information possibly related to search for 3 missing Israelis, police investigate. On Monday information came in from one of the ships searching for the missing three Israelis, who disappeared while rafting on Wednesday. The ship in question has sonar capabilities. According to Channel 10, the Israel Police are investigating the reliability of the information received. 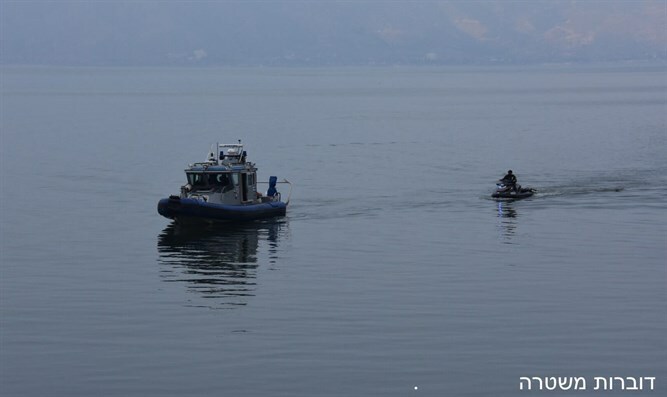 On Monday morning, the ships' search concentrated mostly on the Kinneret's (Sea of Galilee) eastern rim, where the three were last seen. Police observation balloons and multicopter drones were also used during the search. A team from the IDF Navy joined the search efforts on Sunday afternoon, adding 3-D sonar scanning capabilities. Israel Police Commissioner Roni Alsheich said on Sunday that he assumes 19-year-old Itamar Ohana, 21-year-old Nahman Itah, and 17-year-old Liron Karadi were swept away by Wednesday's strong winds and are no longer alive. "We are assuming that the missing Israelis are no longer alive," Alsheich said. "We will continue searching professionally, both under the water and above it. The navy's sonar, which is being set up as we speak, will significantly aid our ability to scan specific areas."